When I was in high school, we had to read The Jungle by Upton Sinclair. If you read the book, you can probably guess where this is going. I quickly gave up red meat, and haven’t eaten it to this day. I do eat poultry, but I toy with the idea of going vegetarian. I bring this up because on one of my first few dates with my ex-boyfriend, he took me to Fogo de Chao, a Brazilian steakhouse where the servers walk around with meat on skewers. (Hmm, dating red flag?) They had one chicken option and of course, it was wrapped in bacon. However, they also have a ridiculously good salad/side bar and pao de queijo, tiny cheese rolls made with tapioca flour. I was probably the restaurant’s favorite customer ever, because I ate mainly veggies and bread; they made a ton of money off me. Fortunately for me, there’s another Brazilian restaurant, Bossa Nova, in my neighborhood. 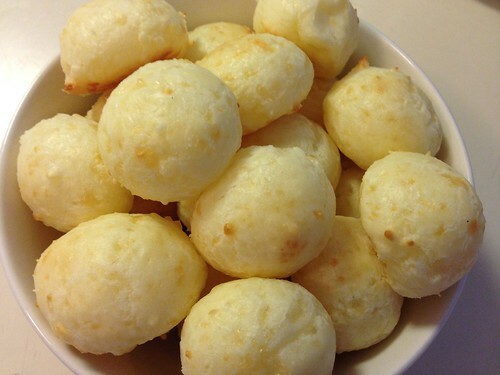 They also have pao de queijo, and they even have chicken, sans bacon! I’ve gone regularly over the years and recently became obsessed with their cheese bread. So much in fact, that I decided to give a recipe a whirl. 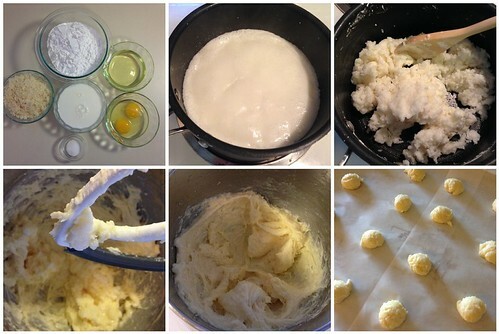 This recipe was super easy, and the puffs were delicious and pretty close to the restaurants’ versions. I probably wouldn’t make these without a stand mixer and cookie scoop, but if you have both of those, you’re good to go! And, because these are made with tapioca flour, they’re kosher for Passover (and also gluten free). This is a life changer! Combine the milk, oil, and salt in the saucepan. Whisking occasionally, bring to a gentle boil over medium heat. Remove from heat as soon as you see big bubbles coming through the milk. Add the tapioca flour to the saucepan and stir until the tapioca flour is completely incorporated. The dough will be grainy and gelatinous. Using a cookie scoop or tablespoon, scoop rounded portions of the dough into mounds on the parchment-lined baking sheet. Space the mounds an inch or two apart. Dip your scoop in water to prevent sticking. Transfer the sheet with the puffs to the oven and immediately turn down the heat to 350°F. Bake for 20-30 minutes, until the puffs have puffed, the outsides are dry, and they are just starting to color. Cool briefly and eat. Leftover puffs can be kept in an airtight container for up to a week and re-crisped in a warm oven or toaster oven. Yields: I used a small OXO cookie scoop and got around three dozen puffs. Are you in charge of desserts for the Passover seders? Have no fear, I’ve got you covered with lots of delicious treats! Our faves are the Chocolate Walnut Cookies, Chocolate Chip Meringues, and of course, Matzo Brittle. Have a great Pesach! 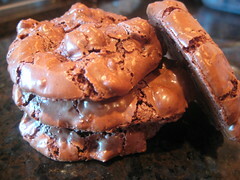 My family’s faves are the matzo brittle and chocolate walnut cookies, they are both delish!